Standard room amenities : Cable TV, microwave, coffee maker, AC, electronic door locks, hair dryer, iron, refrigerator, telephones with voice-mail. Hotel amenities : Lounge with a pool table and video poker/slots, game room, laundry service, maid service, safety deposit box, rental car company office. 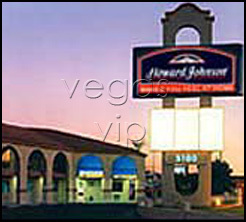 Conveniently located less than a mere mile from McCarran International Airport, Howard Johnson offers amenities for both the business and pleasure traveler. 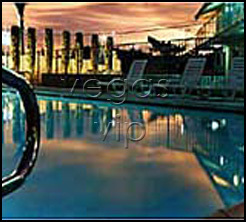 The deli offers breakfast, lunch or dinner and guests can also relax by Ho John outdoor pool. For the business minded traveler, meeting rooms at Howard Johnson can accommodate five to 100 people. In addition, a 24-hour complimentary round trip shuttle makes it an easy venture in seeking the airport or the Las Vegas Strip.